Me: So, there is this park in Maryland, I think it would be perfect for you and Hugo. Google ‘Glen Echo Park‘. Abby: Oh, that park is so cool! Me: I know, right! It’s incredibly retro and I’d be lying if I said I didn’t want to have a session there. PS: I think I might have told her it would be perfect with her teal-colored hair. I love when things just go together like peanut butter and jelly! The week of the session, I watched the weather like a hawk. This summer has been a good one for storms. Since Glen Echo Park is part of the National Park Service and requires a permit, there aren’t any re-do’s, at least not without paying for another permit on a different day. So, folks, we were doing this session, rain or shine. We played the odds of 50% thunderstorms, and the day dawned bright and sunny, with a few puffy clouds here and there. For mid-August in Northern Virginia, it wasn’t even that hot, about in the mid-80s! 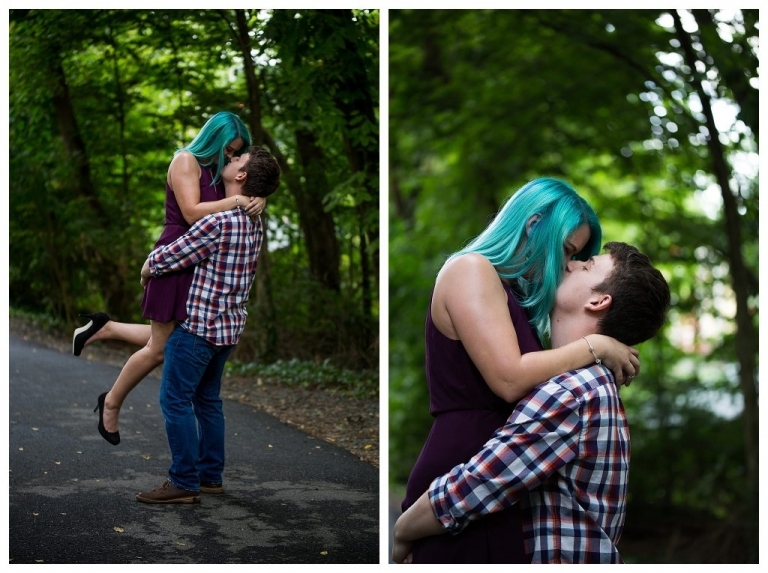 I captured some beautiful images of Abby and Hugo on the bridge leading from the parking lot over the small creek into Glen Echo Park, and then we ventured into the park itself. People walked by us, and everyone loved Abby’s hair! 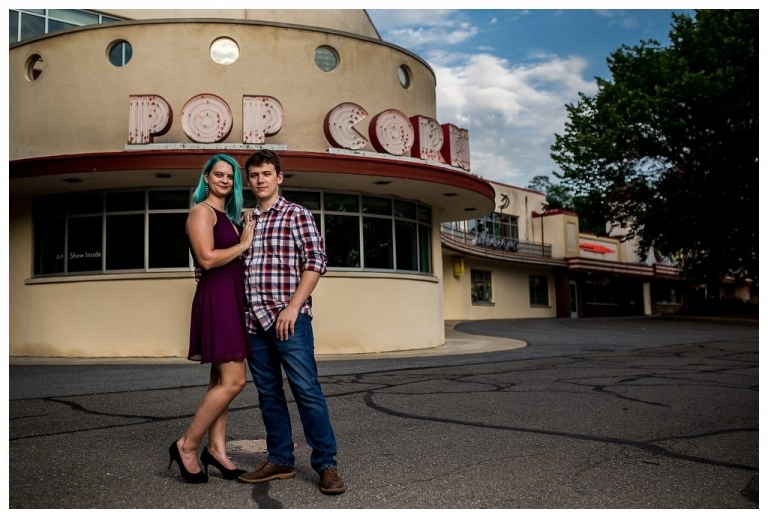 Glen Echo Park is a great place to have your session, because of the cool, retro architecture, neon signage, and wooded backdrops, and we took advantage of all that we could. While we were having a ball on the swing sets near the Crystal Pool, we heard a boom of thunder and I looked over my shoulder to see a dark, ominous cloud rolling toward us. You know what we learned that night? Glen Echo becomes something out of a horror movie when you have to take shelter in an covered outdoor theater while you watch the neon signs and street lamps blink on/off while waves of rain blow sideways, and thunder and lightning clap loudly overhead. After the storm blew through, which took about 30 minutes, we stepped back out and got back to the business of making beautiful photographs. I captured a few more wonderful images for them, and then one that looks like it could be right out of a horror movie, which you’ll find at the end of this blog post. We were all Instagramming the weather while we waited it out and laughing at how ridiculous it was, and how, if this had been a horror movie, we’d for sure be the ones to die first! 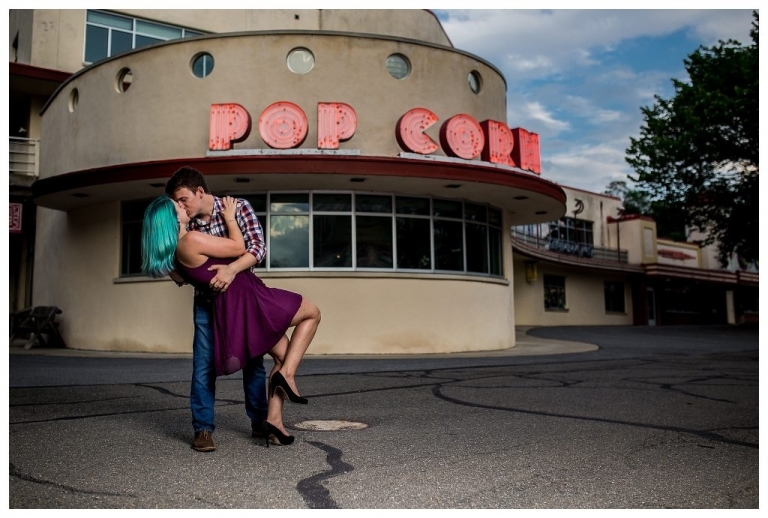 Abby and Hugo’s couples session at Glen Echo has become one of my very favorite sessions to date. The love they have for each other was so apparent (you can see it in the way he looks at her in these images! ), and they laughed constantly with each other. I was so happy to be able to create such gorgeous images for them! The dip is our mutual favorite!